you protect your children online. Control screen times on all of their favorite devices. Regulate your kids’ device usage, and receive detailed real-time reports on their time online. Create GPS safe zones, so you always know their whereabouts. View a real-time map to check your kids’ location, and receive an alert when they leave a pre-set safe area. Get instant notifications on location and unsafe Internet activities. Know immediately when your kids encounter unsafe websites, activities or situations. Catch cyberbullying and inappropriate calls, texts, and social media activity. Keep up with changing interests, and guide your kids towards a positive online experience! 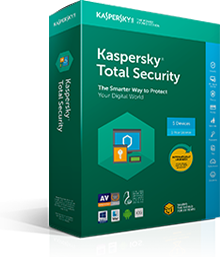 Kaspersky Total Security includes everything you need to safeguard your entire family from the latest online threats. With its innovative technology and advanced features, you’ll have the power to protect your family’s money, privacy, identity, data and more. No wonder it’s the most award-winning Internet security in the world! Secure every online shopping and banking transaction with award-winning Safe Money technology. Ensure safe Wi-Fi connections, block webcam spying and browse the Internet without being tracked. Sync, generate and secure strong passwords and auto-fill forms with Kaspersky Password Manager. Protect important files with free online backup, easy data encryption and our File Shredder technology.